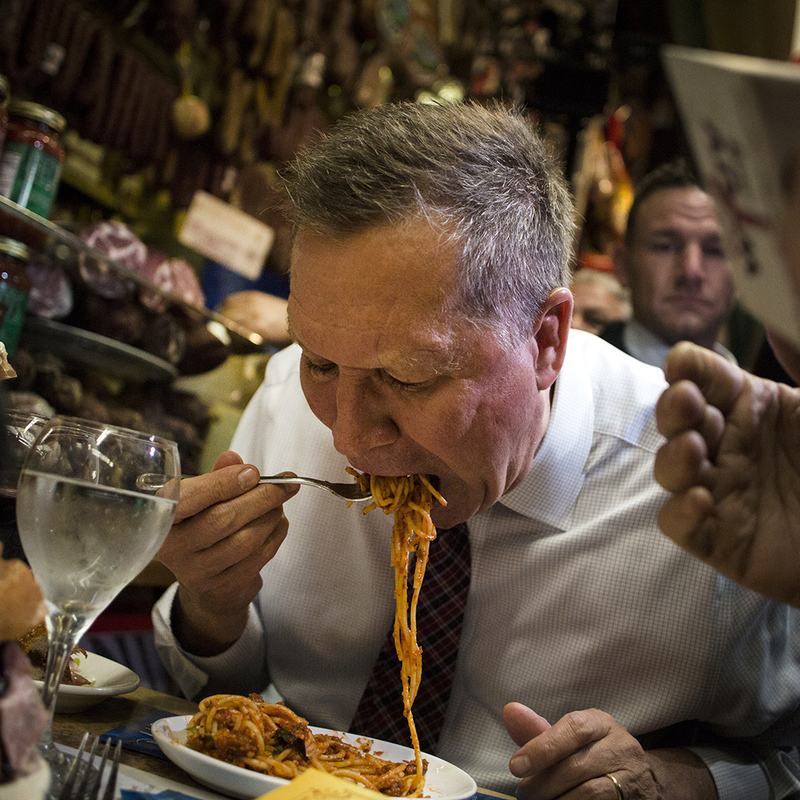 Can John Kasich Eat His Way Back into New Yorkers' Hearts? Last week we brought you the very troubling news that Republican presidential candidate John Kasich had committed a near campaign-ending faux pas against New York: He ate pizza with a fork. It's a blunder that, in the past, caused trouble for Donald Trump, Sarah Palin and Mayor Bill de Blasio with residents of the Big Apple. The offending use of utensils was even addressed in a lesson (of sorts) from Bernie Sanders on The View. But Kasich has a plan to keep city folk from casting him aside as another out of touch politician. He's going to eat his way back into their good graces. Perhaps the Ohio governor's Midwestern state fair roots are kicking in, as on Wednesday he gorged on plates of pasta and a giant sandwich and a festival of meats at Mike's Deli on Arthur Ave. in the Bronx. The all-he-can-eat action was captured on Twitter, with photos and video showing the food the deli was presenting to Kasich and the man himself chowing down. One observer claims the governor wouldn't let the staff take away his second plate of spaghetti before he'd had his fill.